A Mercedes dealership accused of demanding a “mafia-style bribe” from a New York body shop in exchange for renewing an OEM certification sponsorship has fired back with a defamation countersuit. “Truth is a defense, and we’ll see you in court,” North State Custom attorney Anthony Mamo said Thursday in response to the countersuit. According to Coccaro, the dealership sought a 25 percent payment on labor and to make 100 percent on parts sold to North State Custom. “Celebrity’s body shop coordinator also informed North State Custom’s representatives that Celebrity would no longer be selling the parts required to repair the vehicle to North State Custom but rather, Celebrity would be giving the parts to North State Custom and Celebrity would then charge the customer or its insurance company for the repair parts and receive the entire mark-up on those parts, with North State Custom receiving nothing from the sale of those parts,” the lawsuit states. “Celebrity’s Court filings state that after a dispute arose with North State regarding the manner in which North State would bill Celebrity for parts, North State claimed falsely that ‘Celebrity is not a registered authorized repair shop,’ and it accused Celebrity of unlawful conduct,” a news release from Fox Rothschild partner Marc Gross, Celebrity Auto’s attorney, stated Thursday. The North State Lawsuit stated that the dealership sought to upend the claims process by demanding that “whenever a Mercedes-Benz vehicle comes into Celebrity for a repair, that vehicle would be evaluated for repair at the Celebrity Dealership by Celebrity employees who would write a repair estimate and arrive at an agreed repair price with the customer or his/her insurance company and then send that car to North State Custom for it to do the repairs in accordance with Celebrity’s estimate of repair,” the lawsuit states. It alleges that Celebrity also wanted to invoice the customer. If North State Custom refused Celebrity’s terms, the dealership wouldn’t sponsor their Mercedes certification any longer, the body shop alleged. “It was a flat-out, mafia-style bribe,” Coccaro said in October, one of the comments called defamation by the countersuit. “North State and Coccaro communicated such claims to third parties, other than Celebrity, with the intent of lowering Celebrity’s general reputation in the community and/or deterring third parties from associating with Celebrity,” the countersuit states. New York regulations allow any registered “motor vehicle repair shop” — which Celebrity is — to conduct auto body repairs, according to the state DMV. No special endorsement to that license is required to get into body work. “It is beyond dispute that Celebrity is a licensed repair shop and Plaintiff, an experienced litigant, knew or should have known that its contrary contentions were recklessly made,” the memo states. 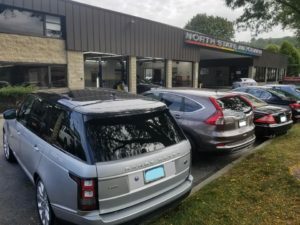 But North State Custom in a revised complaint Monday and Mamo on Thursday argued that the dealership would fail to qualify as a collision repairer in practice. “They couldn’t refinish the car,” Mamo said. Celebrity’s motion to dismiss also raises an interesting argument — and one that if successful, might give OEMs, dealerships and repairers even more food for thought about the notion of dealerships sponsoring certified body shops. According to Celebrity, it’s not illegal in New York to demand payments in exchange for OEM certification business.